A common problem many women and men have is the occurrence of visible and often symptomatic varicose veins, usually involving the legs. 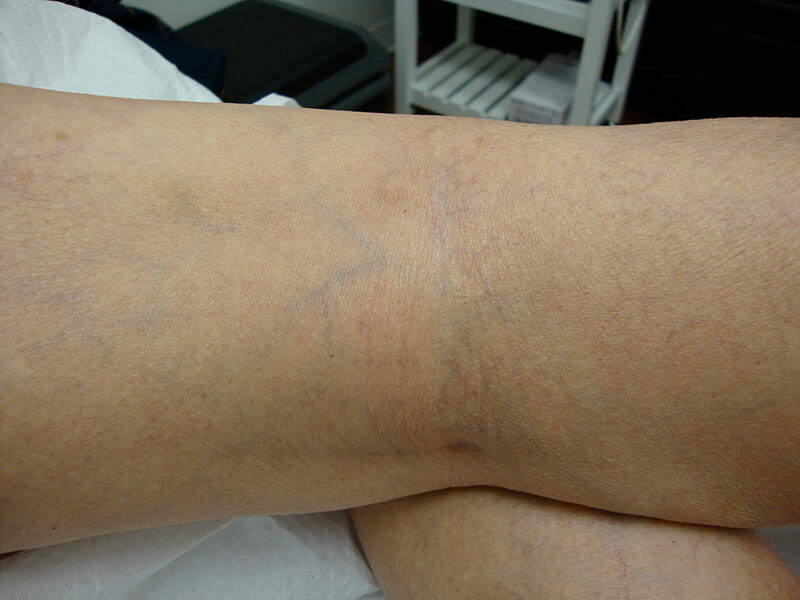 These veins can range from individual spider veins, to clusters, to larger bluish veins, all the way up to ropey, bulging, and painful varicosities. In the most severe cases, patients can develop ulcers of t!he skin that signify longstanding, untreated, venous insufficiency. So, what is venous insufficiency? The superficial veins in the legs are designed to carry blood in one direction, which is from the feet upward. This upward, unidirectional flow of blood is maintained by a series of one-way valves distributed all along the superficial venous system. These valves allow blood to only flow upward and prevent blood from flowing back toward the feet. Certain conditions, like pregnancy, gender, genetics, and occupations where one must stand for long hours, can contribute to these valves becoming dysfunctional. When these valves break down, blood can flow back toward the feet causing a condition called venous reflux. The problem usually starts off in larger veins deep to the skin which can only be identified by ultrasound mapping of the venous system. These larger, deeper veins develop venous reflux and eventually feed the more superficial veins they are connected to. These superficial veins are the visible varicosities and spiders veins most patients are familiar with. If left untreated, over time patients can develop symptoms and signs like leg pain, achiness, fatigue, nocturnal cramping, itchy skin, swelling of the legs, tenderness of the veins, darkening or inflammation of the skin, induration of the skin, and in severe cases, ulceration of the skin. This process is called chronic venous insufficiency. The speciality area of medicine involving the diagnosis and treatment of varicose veins is called Phlebology. A very effective treatment used worldwide to treat varicose and spider veins is sclerotherapy. This treatment involves injecting a medicated solution, under ultrasound-guidance, directly into the problem veins. The sclerotherapy solution causes the vein to scar and collapse, causing the blood to reroute through healthier veins. The collapsed vein is eventually reabsorbed into the local tissue and eventually fades. Treatments are performed by Dr. Mah at Nova MD in Prince George, and at Restore Vein and Skin Centre in Kelowna. Dr. Mah is a Fellow of the Canadian Society of Phlebology and a Member of the American College of Phlebology. YES, I’m interested in a Sclerotherapy for Varicose Veins consultation.